Another library patron is waiting for The Deep by Cal Newport, so I'm going to wrap up my thoughts on the book. Some people thrive without working in depth, but they tend to be high level CEO's whose jobs involve making decisions, not generating new work. Someone else in the organization does that for them. The trend toward open and distracting office space and use of social media for business decrease workers' ability to do deep work. 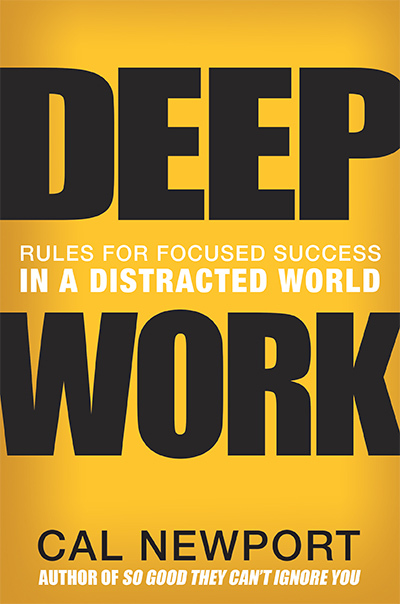 The second half of the book involves ways to get into deep work. I found a lot of this aimed toward privileged workers who are in positions in which they can cut themselves off from others so they can work deeply in a monastic manner or can periodically devote a large chunk of time to deep work while eliminating other kinds. It's a bit of a fantasy for most writers who are often working jobs, writing/editing for hire, and/or dealing with families. Newport talks about: 1. Attention fragmentation, when our attention is...fragmented and we're not able to concentrate, a concept I like. 2. Mastering hard things (like staying on task for deep work) requires deliberate practice. He says it's actually more important than natural talent. Deliberate practice I can get behind, too. What that deliberate practice should be/can be I'm not clear about, though. The rest of the book is filled with disciplines and reasons, examples and tips. James Le does an excellent job of describing the book content in his blog post The 6 Productivity Strategies to Integrate Deep Work into Your Professional Life. For myself over the last few weeks I've often had days filled with appointments and telephone calls when I could only write a few sentences. When I have that little time, I need to work on work, not on time management so I can work. Time management has to be something that doesn't require a lot of time and effort. I'm still thinking about trying to develop some kind of slow work process. Since I've admitted that I sometimes only get a couple of sentences a day written, I know it could be argued that I'm well down that road.